This is a sponsored conversation written by me on behalf of Arizona Milk Producers. The opinions and text are all mine. 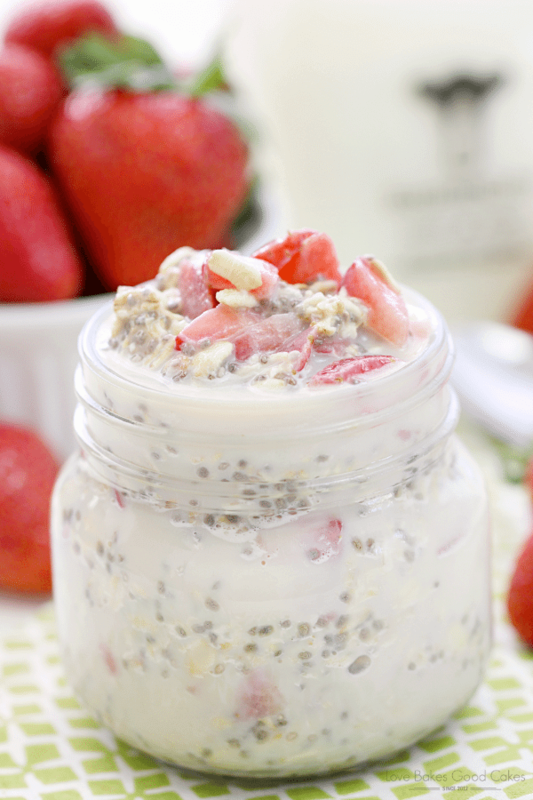 “Fuel up” like Team USA with this Strawberry Vanilla Overnight Oatmeal recipe. 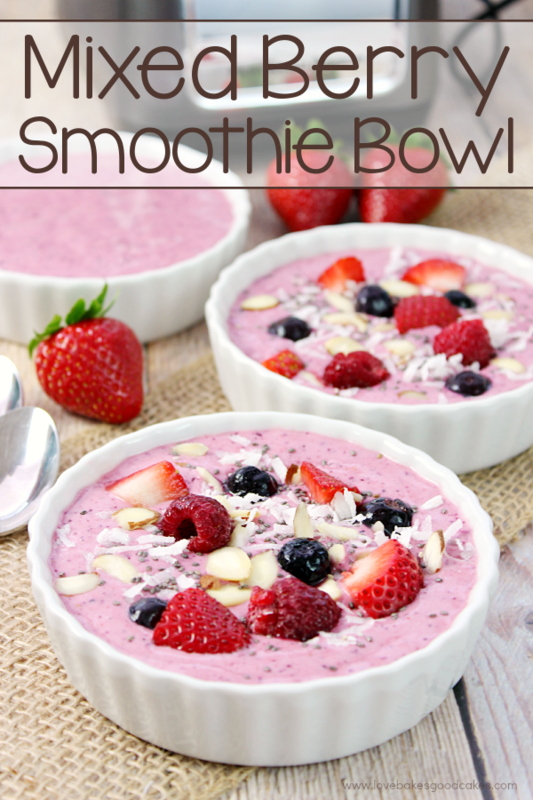 It’s a great way to start your day with a delicious and healthy breakfast! You may recall at the beginning of the year I mentioned that I had a few things I wanted to work on in 2016 … one of those things being getting healthier. For me, healthier means making better food choices and learning to be more active. I’m going to be honest with you, the life of a food blogger can be very counter-productive to a healthy lifestyle when you are constantly surrounded by food and you spend so much time sitting in front of a computer! I decided that 2016 is the year I stop making excuses ……. One of my goals was to lose 20 pounds by the start of the Rio Olympics in August. Although it sounds easy enough, I knew I was going to have a few struggles along the way and I really wanted to set a goal that was attainable. So far, I’m down 13 pounds with 7 pounds left to go. I’d be ecstatic if I could make it to 25 or 30 pounds by the Opening Ceremony of the Rio Olympics! Along with exercise, one of the biggest challenges for me has been getting a healthy breakfast in when I’m not really a breakfast eater. It’s hard to eat breakfast when your breakfast staple is toast and coffee, and you haven’t really eaten a real breakfast in years. I know that breakfast is the most important meal of the day so I have been working on retraining my mind and my body – and believe it or not, I have actually found a few things I actually enjoy eating for breakfast! One of my faves is overnight oatmeal …. have you ever tried it? I have to be honest, I was not a real big fan of oatmeal – you know, the hot kind?! That whole texture thing just didn’t do anything for me. Knowing the benefits of oatmeal, I was convinced that I needed to find a way to like it …..
Overnight oats seem to be what all of the cool kids are making and eating these days so I decided to give them a try back in January and I am still loving them here in June!! I love that with just a handful of ingredients and a few minutes of prep work the night before, I have an easy and delicious breakfast waiting for me in the morning …. no more excuses! Making toast now requires more time and energy than taking the lid off of my bowl of oatmeal in the morning! Holla! 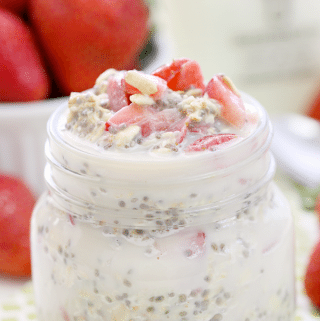 Although I have made a few versions of overnight oatmeal over the past few months that I enjoy, this Strawberry Vanilla Overnight Oatmeal ranks high on my list of faves! I love knowing that I am giving my body the fuel it needs and it’s something that actually tastes good! When I am looking for a little bit of a morning treat, I add a tablespoon or two of good-quality chopped dark chocolate to the mix …. it almost feels like it sends it to the dessert zone! Almost. 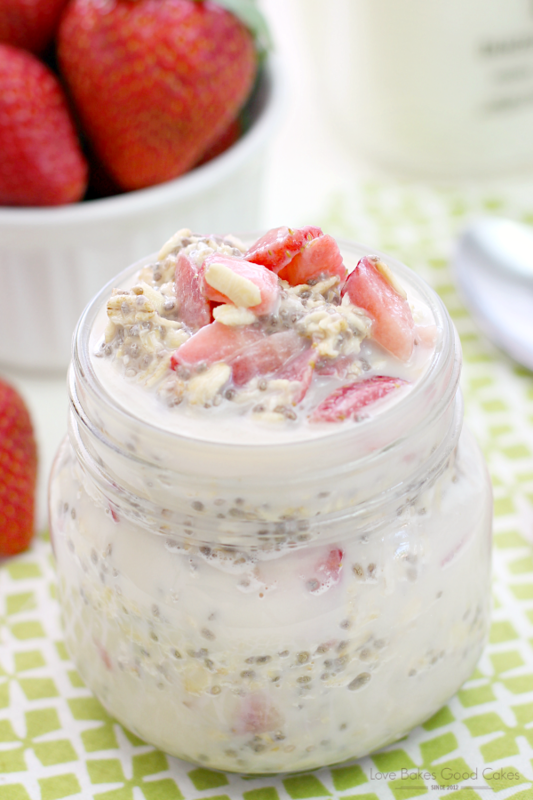 So, overnight oats start with oatmeal … obviously. 🙂 I add a few other ingredients like chia seeds, maple syrup, and fresh juicy strawberries, then I top it all off with non-fat milk. After mixing well, I just let it chill in the fridge until the morning! 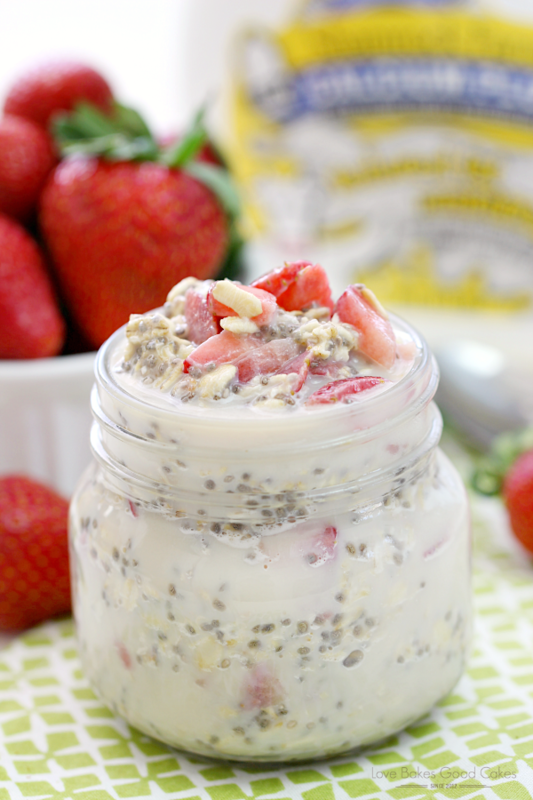 Even my kiddos have taken a liking to overnight oatmeal – especially this Strawberry Vanilla Overnight Oatmeal! Although I don’t train like an Olympian, I know that milk is a great source of calcium, vitamin D, magnesium, protein as well as other nutrients. One of my goals is within reach and all eyes are on the Rio Olympics. Will you be watching the Olympics this year? I can’t wait – I looove watching the summer Olympics!! As you know, milk has always helped power the potential of athletes. Now, the industry is proud to officially support the U.S. Olympic and Paralympic teams on the Road to Rio and Arizona Dairy Farmers are celebrating by helping you “Fuel Up Like Team USA” this June Dairy Month! Arizona Milk Producers has also partnered with AJ’s Fine Foods and United Dairymen of Arizona to help those in need fuel up like Team USA through the Great American Milk Drive. United Dairymen of Arizona will be donating one gallon of milk for every entry into the “Fuel Up Like Team USA” online giveaway (up to $7,500) and AJ’s Fine Foods will be encouraging consumer donations to the Great American Milk Drive in their 11 Arizona stores. To learn more, and enter the “Fuel Up like Team USA” Giveaway, visit arizonamilk.org. Daily winners will be chosen randomly for the chance to win an Olympic duffel bag, the Dairy Good Cookbook and free Shamrock Farms dairy product certificates. The grand prize winner will be randomly chosen out of all entries on or around July 6 to win Olympic swag and a year’s supply of dairy products. to get up to date info on community events, ways to fuel up, and much more! 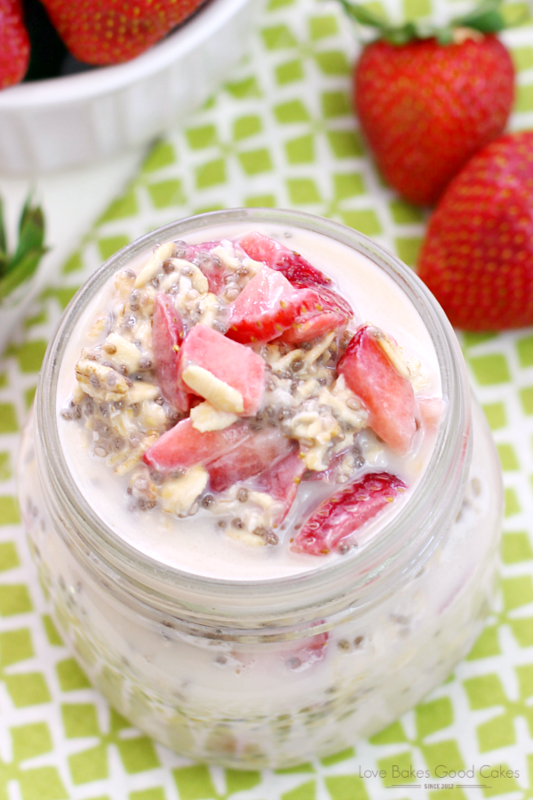 "Fuel up” like Team USA with this Strawberry Vanilla Overnight Oatmeal recipe. It's a great way to start your day with a delicious and healthy breakfast! Mix all ingredients in a 2-cup bowl. Refrigerate 6-8 hours or overnight. I don't have protein powder. Would it be okay to leave that out? 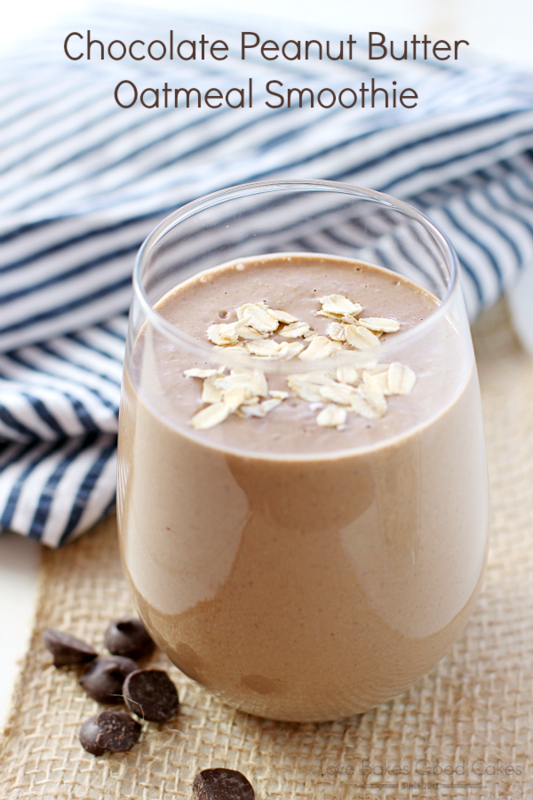 Is it just for the extra protein in your diet, or does it help the recipe in other ways? 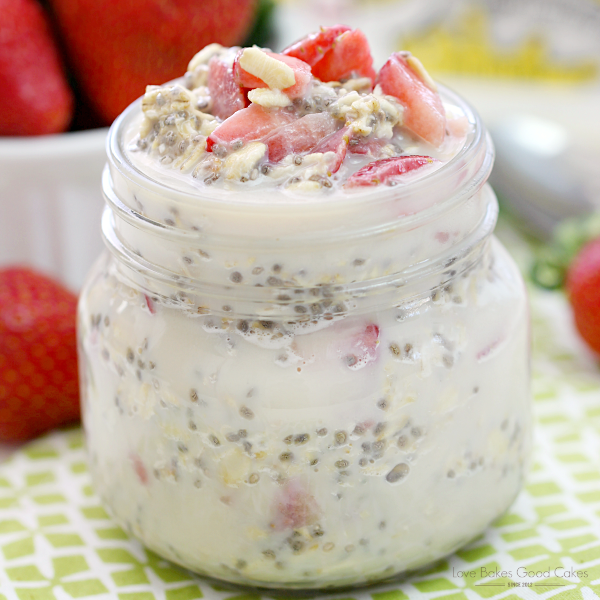 I love making (overnight) Chia Pudding but I've never put Chia seeds into my overnight oats before. I'm surprised that they don't change the texture. I'll have to give it a try! What a perfect summer breakfast….I love the flavors and especially the fact that it requires nothing of me in the morning!! Can I warm this up in the morning? Hi Ashley! I'm guessing you could although I have never tried it! We usually enjoy it cold, but if you do try it warm, I would love to know your feedback! this one i am copying, i am in Kenya, looking for a way to eat my oats…. Can the oats be heated up in the morning?